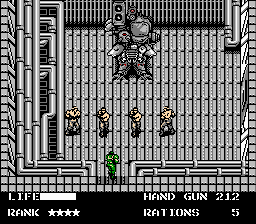 If this patch needs to be updated, please try to replace the big computer to destroy in the finla level by Metal Gear. I'd like to, but it's beyond my ability. Maybe fifteen years ago, I would have devoted most of my free time toward learning 6502 Assembly, but now I can barely drag up the will to make a bowl of soup. If GEARTOOL was less cumbersome and arcane, I could change it visually, but that would still require programming to add the lasers and the pattern required for destroying Metal Gear, rather than just "drop 13 semtex bricks". Perhaps somebody could port over the changes from the JP version? I had ZERO luck even changing the end screen in the Blaster Master hack I did, so that's another thing I cannot do. I'd like to, but it's beyond my ability. Maybe fifteen years ago, I would have devoted most of my free time toward learning 6502 Assembly, but now I can barely drag up the will to make a bowl of soup. If GEARTOOL was less cumbersome and arcade, I could change it visually, but that would still require programming to add the lasers and the pattern required for destroying Metal Gear, rather than just "drop 13 semtex bricks". Perhaps somebody could port over the changes from the JP version? I had ZERO luck even changing the end screen in the Blaster Master hack I did, so that's another thing I cannot do. I understand, thanks a lot for all your deeds , and yes, maybe someday, someone will update the patch ! Often, they can, provided the data in the ROM is laid out in the same manner. In the case of Blaster Master, it made a mess, as the layout code of the end screen in the US version is very different from the JP version, and I wasn't able to just brute-force copy a large chunk over. The ROMs are different sizes, as well. Ported Arty's TX-55 patch for usa, europe. But the speech is not corrected yet (haven't played that part). After a full test, it'll go on-site as an addendum for Arty's patch. Regarding MSX Style project, looks compatible so far from limited testing. And I really have no idea how to add lasers or its programming (into such a crammed rom). Ported Arty's TX-55 patch for usa, europe. But the speech is not corrected yet (haven't played that part). After a full test, it'll go on-site as an addendum. Well, if the color palette for the room is changed to the tan/blue scheme of the MSX version, that could pretty well complete things as far as would be practical, barring significant ASM re-coding. I didn't want to use parts of anyone else's hacks in mine, due to the constant issues I have with this site already. I tried swapping things out but the colors for that room end up becoming a washed mess. It would take some careful tile recoloring and palette reassigning to make the mech and room resemble more msx paintbrush. Which is beyond the simpler porting formula of copy-paste-tweak. Oh, yeah, if it's using the locked palette for all of the "just gray" stuff, changing it could make a lot of things rather messy. 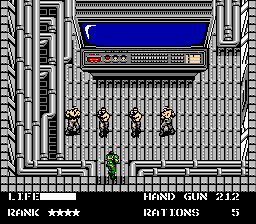 All of the weapon pickups share the same palette as the enemy grunts, so without being able to reassign palettes properly... bleh. Well at this point, color isn't really an issue. Or maybe I'm just rambling. I'll take a peek at it to see if I can do anything. Alrighty, located the addresses needed to change the colors, but a trace will have to be run for the parts that cycle colors. Changing the colors to 18 and 0C looks kinda' ugly, despite them being closer to the MSX palette for the room. The problem with changing the colors normally is that the tiles with lights for the TX-55 are set to flash, so hunting down the code that defines these colors is what the trace is needed for. Bit of a migraine right now, making focusing difficult, but this information should help root out that last bit. What is not known at this point, is if changing the values for this room will have any effect on other tiles in the game. But that is a worry for another day. There is 1 glitch when entering the computer room (vanilla, Arty). If you pay very close attention to the tiles that flash, it will have a bad palette ($18102) for a few frames. When it starts going through the 3-cycle palette blinking, the error disappears. Although I experimented with a possible color fix for this error, I'm also uncertain about any side-effects. For the 3 blinking palettes, I think it's tied to just the computer room. Stored near the same area as the post-destruction tilemap ($b19b). TX-55 uses palette 3 for red lights. I'm wildly assuming that game does not recycle any of these palettes elsewhere. So you can force all 3 cycles to same color for 2,4. I couldn't figure out a re-color scheme and gave up on it earlier. But yeah, a full playthrough is required regardless. I have a borked-up save state right inside the room, and you can freely enter and exit to check on changes. Be advised that you should use an infinite health and ammo cheat, because the grunts respawn, and the electrified floor is right outside. If you are fixing the spelling and grammar, wouldn't it make more sense to also fix the usage? Visual cues to let the player know the status, but not as a "verbal" command from an NPC. Because the grunts say that they fell asleep after they wake up from having fallen asleep. Also if you've ever had a day job, you would know that people will often report the end of their shift to let people know of the changeover.